Open Class: Brass: Vanguard Cadets (13.7), June 23, Sacramento, CA Percussion: Blue Devils B (13.3), June 22, Stanford, CA Color Guard: Vanguard Cadets (12.3), June 22, Stanford, CA View all scores and recaps. 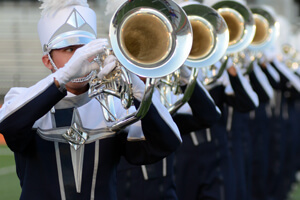 Storylines to watch • For Better or Worse: Perhaps thanks to a later start of this summer's DCI Tour leaving extra time for spring training rehearsals, most World Class corps trended ahead of their season-opening scores 2013 vs. 2012. Numbers indicate the points above or below their first performance of the season this year compared to last: The Academy (+4.3), Blue Devils (+0.65), Blue Knights (+5.2), Blue Stars (+0.4), Bluecoats (+2.2), Boston Crusaders (-4.75), The Cadets (+3.9), Carolina Crown (+4.55), The Cavaliers (-0.8), Crossmen (-0.6), Madison Scouts (+0.5), Mandarins (+2.85), Pacific Crest (+0.35), Phantom Regiment (+2.0), Pioneer (-0.6), Santa Clara Vanguard (+4.55), Spirit of Atlanta (+0.5), Troopers (-3.0) • While Carolina Crown tours the West Coast with the Blue Devils early this summer, fans have already seen heated competition between 2012's first and second place finishers. 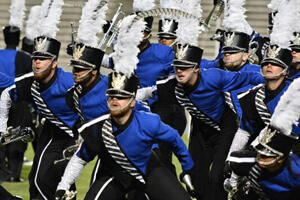 In their first meeting on June 21 in Clovis, Calif., Crown bested the Blue Devils 74.50 to 74.35. A day later, Blue Devils pulled ahead by seven tenths of a point. Crown, however, narrowed that gap slightly June 23 in Sacramento, but still finished four tenths of a point under the defending Champs. • After winning June 16, 2012 in Akron, Ohio, the Cadets' win this summer on June 21 in Belvidere, Ill., is the second year in a row the corps has won its season-opening event. With Blue Devils and Carolina Crown trading wins out west, the Cadets with three wins already this season, is the only of currently competing World Class corps to have the chance to pull off an undefeated season in 2013. 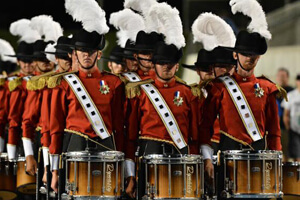 • Santa Clara Vanguard continues to see strong performances from its percussion section, outscoring the competition (including the 2012 Fred Sanford Best Percussion Performance caption award winning Blue Devils) in every event so far this summer. • After finishing 2012 just five hundredths of a point below the second-place Open Class corps Blue Devils B, Vanguard Cadets are again hot on their tail in Pacific region competitions. On June 21 in Clovis, Calif., Blue Devils B earned a first-place score of 60.55, with Vanguard Cadets just three tenths of a point behind. 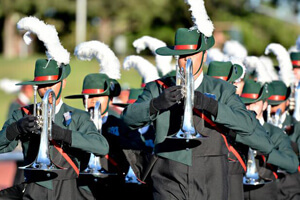 The gap between the two corps widened the next night, in Stanford, as Blue Devils finished seven tenths of a point above Vanguard Cadets, but the two were close again on June 23 in Sacramento, with Blue Devils B winning by just two tenths. • A heated rivalry may be developing between the Cavaliers and Spirit of Atlanta for 2013. 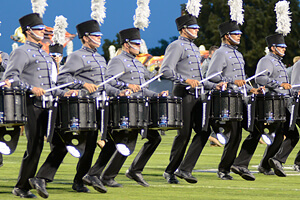 While the Cavaliers pulled away from Spirit at the end of the 2012 season, the two corps finished close in score throughout the middle part of the summer. Spirit even went ahead of the Cavaliers for the first time since 1986 on July 7, 2012 in Kalamazoo, Mich. Back to 2013, the Cavaliers started six tenths of a point ahead of Spirit on June 21 in Lexington, Ky. Two days later, Spirit went ahead of the Green Machine by a slim margin of 0.15. • Top 12 Vendetta: After the Crossmen were responsible for knocking the Blue Stars out of contention for a spot in the 2012 World Championship Finals, the Blue Stars put up a score nearly a point ahead of the Crossmen in their first meeting this summer, 65.15 to 64.20 in Bowling Green, Ohio on June 23. • Though finishing three points under the Cavaliers and Spirit of Atlanta in Bowling Green on June 23, looking at the caption scores, Blue Stars finished ahead of the Cavaliers in GE Music Rep and Music Analysis Content, and Spirit in Visual Proficiency Content and Color Guard. • As the 2013 Drum Corps International Tour marches into its first full week of competition, corps that will be making their first performances of the season include: Cascades (June 28, Tualatin, OR), Colts (June 25, Paw Paw, MI), Jersey Surf (June 28, Jackson, NJ), Oregon Crusaders (June 27, Medford, OR), 7th Regiment (June 29, Quincy, MA), City Sound (June 28, Oceanside, CA), Coastal Surge (June 25, Paw Paw, MI), Columbians (June 28, Tualatin, OR), Gold (June 28, Oceanside, CA), Impulse (June 28, Oceanside, CA), Legends (June 25, Paw Paw, MI), Raiders (June 28, Jackson, NJ) and Spartans (June 29, Quincy, MA).